Japan’s aging population will be cared for by robots–not immigrant laborers, according to the plans of the Japanese government. The Abe government is increasing investments in healthcare robots to meet the nation’s needs, and recently announced subsidies that will cover up to two-thirds of the research and design costs for the development of various healthcare robots. One quarter of Japan’s 127 million population age 65 and older, and that percentage is expected to rise to approximately 35 percent by 2025. In 2010, according to the Health Labor and Welfare Ministry of Japan, the nation needed around 2 million nursing care workers, but this need went unmet–only 1.33 million workers were employed in 2010. That need will rise to 4 million by 2025, the ministry predicted, and require 1 million mostly foreign elderly care workers. That is why the Japanese government is planning to extend financial subsidies in order to help firms develop inexpensive nursing care robots. The goal is to produce care robots that will be ready for the market by fiscal 2016, and that will cost around $1,000 per unit. 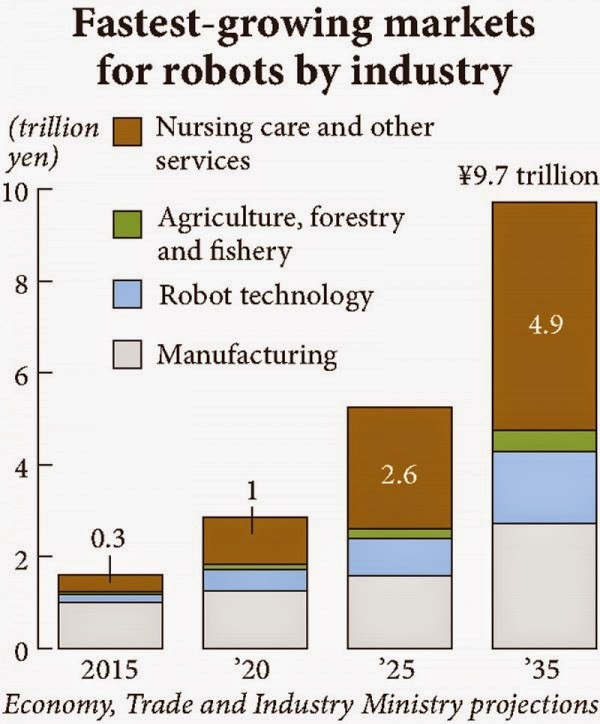 Instead of increasing immigrant workers, Japan will invest in an expanding robotics market that is expected to reach $13.6 billion in 2018, and around $90 billion by 2025. The Japanese government, which is already funding healthcare robot production, is extending research subsidies in order to develop more inexpensive robots for hospital and home use. Beginning this fiscal year, the government will provide subsidies that will cover one-half to two-thirds of research and development costs for care robots–valued at over $20 million. These robots will be covered by nursing care insurance, and will be available for rent at approximately 10 percent of their purchase price. There are several main areas of healthcare robot development that robotics firms are focusing on. One goal is to create a robot that could carry a patient to a toilet. A robotic suit has already been created that can help care staff more easily lift patients. There is also demand for robots that could monitor a patient’s use of medication, robots that could help the elderly to walk, portable, motorized, self-cleaning toilet robots, and robots that could track the location of dementia patients. Special concerns faced by the elderly during emergency situations are also being considered as robot care services. Robots will be programmed to ask patients if they are dizzy and to nag them to stay well hydrated and cool during heat waves. Another area of development is companionship. Already, Japanese robots like SoftBank’s cloud-based Pepper can read and react to facial expressions, gestures and voice commands. 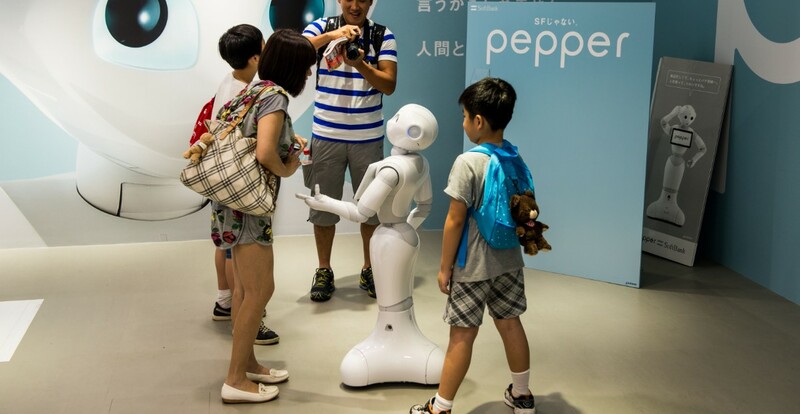 Pepper will be sold to Japanese consumers next year for around $2,000.